Find hotel near Catedral Metropolitana Ma .. 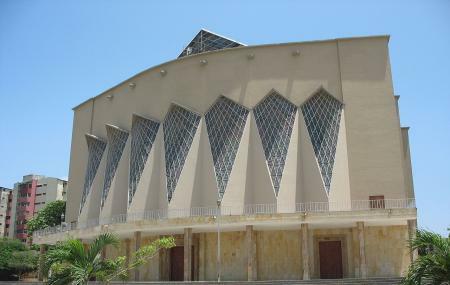 The Cathedral of Virgin Mary is a modern Cathedral whose construction took almost 30 years and was finished in the 80’s. Its unique modern architecture distinguishes it from all other cathedrals in terms of its sheer size and style. It can accommodate upto 4000 people with a plot of about 12,261 sqmt. The cathedral is 92 mts long, 38 mts wide and 38mts tall. A gigantic structure, the cathedral has a very modernist gothic vibe to it. The stained windows itself contains many smaller window of different colours that creates a spectrum of light when it passes through. A must visit. How popular is Catedral Metropolitana Maria Reina? People normally club together Sala Del Carnaval Elsa Caridi and Museo Romantico while planning their visit to Catedral Metropolitana Maria Reina. Enter from the side on Carrera 45 or from the back. Stained glass masterpiece. Calm. Serene. Open air at the top in the front and back. NOT TO BE MISSED! An amazing work of mid-century modern religious art.